This weekend Heather was in Austin Texas at Quit Con, so I (Chris) had went out picking alone. I took full advantage of all of my free time and scored quite a few amazing pieces. 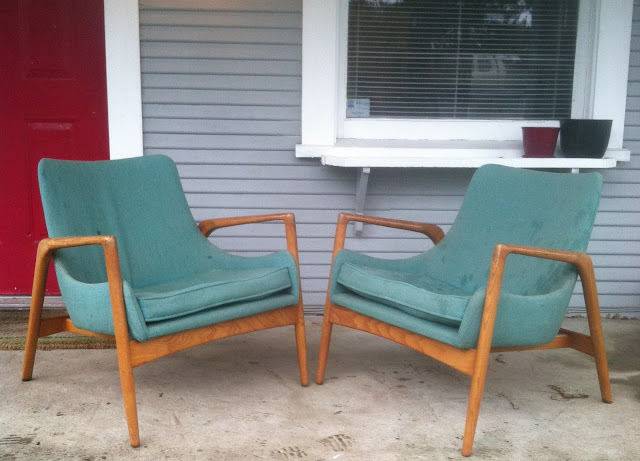 These chairs our one of my favorite finds of all time! When I first saw them I thought that they were DUX, but that is not what I believe they are. The tag which lists materials appears to be American but there are no makers marks to be found. Does anyone know who they were made by? They need to reupholstered. We are planning to recover them in new fabric that is this same amazing fabric. This Heywood Wakefield Kohinoor dresser. SOLD at VDC. Heyhood Wakefield Kohinoor Full Bed frame. SOLD on Etsy. This pair of his & hers Adrian Pearsall style chairs are now available at Hawthorne Vintage for $595. A few weeks ago Heather found the crewelwork piece pictured on the left. This weekend I found the piece seen on the right with a wonderful gold frame. I LOVE those turquoise chairs. I have no idea who made them either, but they have a fantastic shape. That bed is great, too. Chris and I are currently looking for a bed for ourselves and we're having an amazingly difficult time finding something we like. Queen & King size mid century beds can be very difficult to find. Queen beds did not really gain popularity until after the mid century era. The only mcm queen bed that I have ever picked is the one that we own. Wow, those chairs are amazing! Love the shape and the color. And the HW set is a great find too. Thanks for hosting the link up. I have been looking for a pair of mid century chairs for ever, I think they are all in your area! Fabulous finds!!! Thank you for hosting. 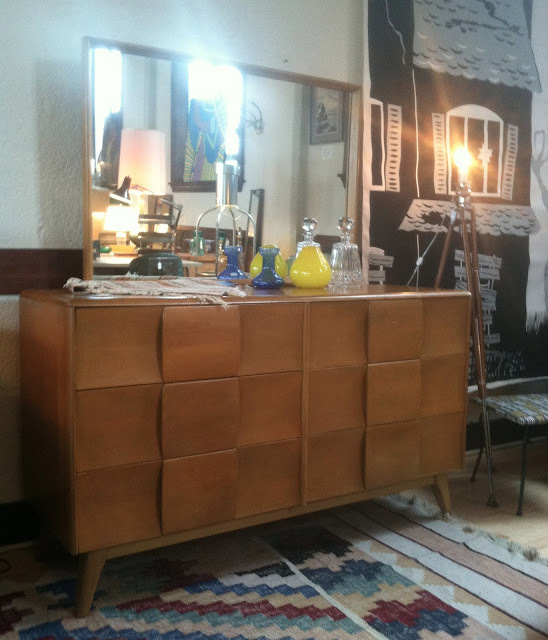 Yes, Portland is flush with great mcm items. You should make a pilgrimage up here in the summer. How great that you found a match to the crewel piece! I like the gold frame better.